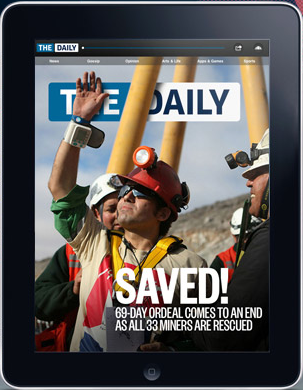 Comprehensive review of the new iPad newspaper, “The Daily”, at Gigaom. The Daily seems nicely done, albeit with some complaints about clunky top-level navigation (JPEG artefacts / blocky thumbnails, I mean come on…). Yet it seems a relatively conservative effort to rethink the newspaper for the iPad. What are some of the areas where a newspaper could rethink more radically? Games – this is one area The Daily does seem to have latched on to, at least a little. Newspaper’s always used to be the source of crosswords, sodoku – and a newspaper with a large readership has opportunities in multi-player games, too. The “daily” nature of the newspaper can be exploited in games. Real-time – perhaps the most obvious, but plainly any digital newspaper can provide a through-the-day stream of updates. Even so, there is user-experience problem to be solved here – how to make the stream relevant; and how to make it as obtrusive as the user wants (not more nor less obtrusive). And this includes video, not just text/photos. Group customization and interaction (“social”) – do your friends read the same content you do? Do you want to know what they’re reading? Do you want to know what they’re thinking abut what you’re both reading? Since one of the reasons people read the news is to discuss with friends and colleagues, what friends and colleagues are reading – or could be encouraged to read – is almost certainly relevant. FaceBook, LinkedIn, Tumblr, Instagram, and Twitter all provide potential mechanisms for interconnecting people and their news. Advertising platform – can you target based on interests, based on on location? Does the newspaper provide advertising inventory management? “Finishability” – how do you provide people with the boundaries they want around how much time they prefer to spend reading the news? This is of course a big advantage of a conventional printed newspaper – once you’ve read it, you’ve read it – but how could that benefit be replicated in the digital world? FlipBoard, a news aggregating startup, is one company that has pushed this as far as anyone. A key thing to note with them, though, is – they are a news aggregator, not (primarily) a newspaper in the sense of journalists producing original content. 99% of all news content becomes free / advertising supported, and news is consumed largely through aggregators who provide the services 1-6 described above. 1% of news is subscription for highly specialized topics. Media conglomerates form that capture enough content that they can be their own aggregator. Though it would not be surprising to see this attempted, I suspect that sources of news are too diverse to make it practical in the long term.